Suspect is jailed after striking officer in the head with a chain lock during a struggle Thursday afternoon. A Portland police officer was slightly injured arresting a man on the Eastside Esplanade on Thursday afternoon. 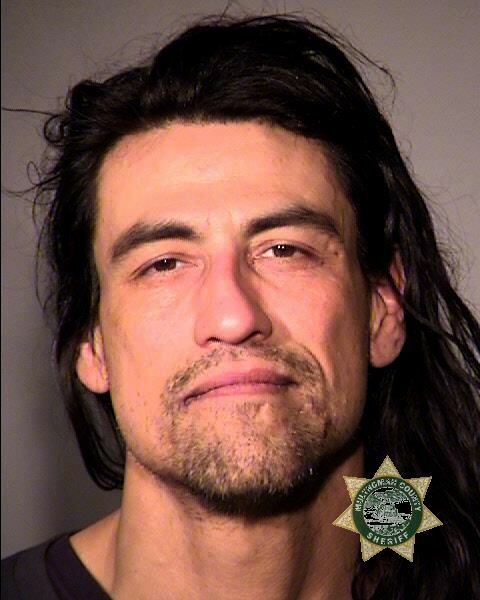 Randall Hartwell, 43, was arrested and lodged in the Multnomah County Detention Center on numerous charges, including assault on a police officer, assault in the second degree and unlawful use of a weapon. The name of the officer was not immediately released. According to police, at 6:44 p.m. on April 11, Central Precinct officers were working a mission with Park Rangers on the Eastside Esplanade. There they encountered Hartwell, who was urinating in public. The officers attempted to contact Hartwell to issue him a park exclusion. Policer say he was immediately aggressive and retrieved a chain lock from his belongings and menaced the officers. When the officers backed away, Hartwell went to a nearby Porta Potty and locked himself inside. While developing a plan to take Hartwell he exited the Porta Potty and began swinging the chain lock at the officers. Attempts to control him with an electronic control weapon failed. As one of the officers attempted to go hands on with him, Hartwell dove to the ground, causing the officer to fall over him. Once on the ground, Hartwell punched the officer in the side of the head while holding the chain lock. The second officer assisted with taking Hartwell into custody without further incident. Because the officer who was struck in the head was displaying signs of a head injury, he was transported to the hospital for evaluation and released.